The Masai are a nomadic people with very little attachment to possessions and a strong sense of togetherness. This is formed when different age groups undergo the circumcision ritual known as ‘emuratare’. The Masai belief that all the cattle in the world was given to them by Enkai, the God. 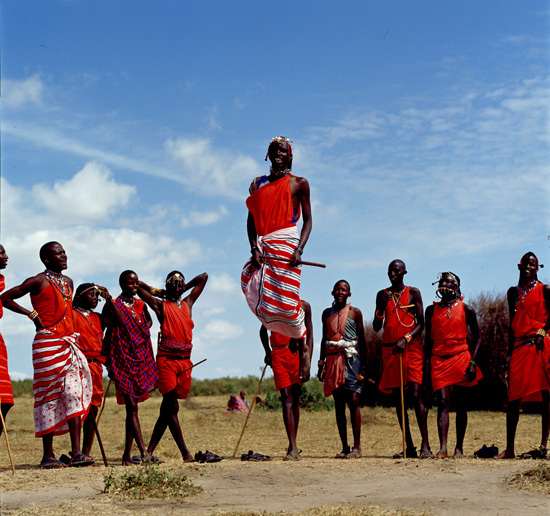 Though the Masai have several dances the best known is the ‘jumping dance’. This particular dance is performed by young men who leap in the air to show their strength. Each young man will jump up as high as they can while the others stand in a circle to sing. The voices of the men get higher as the jumping continues. The Masai frequently perform their cultural dances and rites to outsiders as they are always keen to educate people about their ways and tradition. These performances are one way of helping to keep their traditions alive.